Residential architecture is becoming more complicated, as home owners and developers continue to raise their expectations of design. Today’s endless design possibilities present both exciting and challenging times for engineers. Collaboration between developers, architects, engineers and home owners is becoming ever-more important, as a result of the industry’s need to manage increasing design expectations. Dave Kelly is the founding director of Inertia Engineering, a Brisbane-based firm specialising in civil, structural and environmental engineering design. With 20 years experience, Dave has formed lasting relationships within the industry that have seen him work on housing projects of varying scales. People are changing the way they live. We’re seeing a huge increase in the use of glass, and fewer walls, which breaks down the barriers between indoor and outdoor spaces. People want to connect more with nature. Not only that, technology is advancing so quickly. You never used to be able to get doors that were over five metres long, but those sizes have become normal now. We recently worked on a project that had a 14-metre wide door opening. Both home owners and developers are pushing the boundaries. It’s an exciting time to be an engineer and meet those challenges. The house of today is nothing like the cottage built 50 years ago. Designs are becoming more interesting, and engineering is becoming harder, which is a great thing for the market. This allows us, as engineers, to challenge our normal way of thinking to come up with innovative solutions. People are becoming far more aware of energy efficiency, and we’re seeing an increased use of step ceilings, high-level windows and skylights in places we’d previously never have considered. 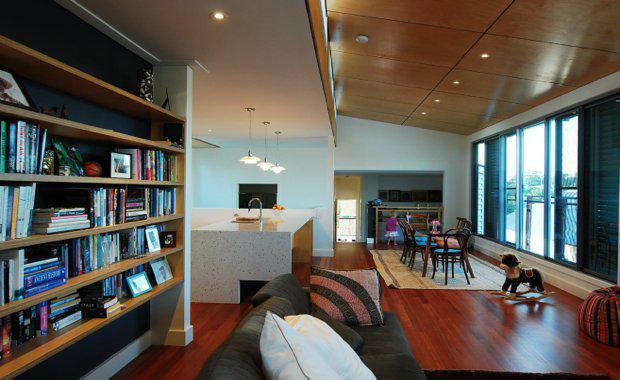 Interesting ceilings make load bearing lines more elaborate, and we’re only seeing this complexity grow. We’re definitely seeing an increase in design collaboration between an owner, architect, engineer and builder. The engineer is often brought in at the last minute, but it is so valuable to get everyone’s input early on in the project, before it goes to site. Of course, it depends on each project and relationship, but I’ve found that people are looking for a more collaborative way of working. We work hard to collaborate with everyone involved in the project, to make sure the best options are explored early on, so the architecture, and client, can benefit.